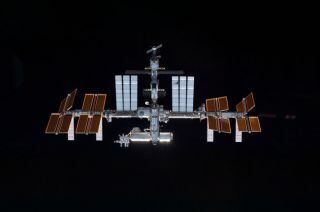 The International Space Station is the largest spacecraft ever built, and its assembly has been ongoing for two decades. Its first component, the Russian Zarya control module that provided the station's initial propulsion and power, was launched Nov. 20, 1998. International crews have continuously occupied it since 2000. $20 million: The amount that Dennis Tito, an American multimillionaire entrepreneur, paid to become the first person ever to fly to the station as a self-funded space tourist. He stayed on the station for eight days before flying back to Earth. 925,000: How much the ISS weighs in pounds (419,600 kilograms), the equivalent of more than 320 cars. 534: The number of days that astronaut Peggy Whitson has spent living and working in space, over the course of several missions. She flew on Expeditions 5, 16, 50, 51 and 52. Whitson also flew on two space shuttle missions. 340: The number of days that astronaut Scott Kelly spent on the station. He holds the record for the longest single mission. 240: The average distance in miles above Earth's surface the ISS orbits (400 kilometers). On a clear day, the ISS is easily visible to the naked eye from the ground. Observers on the ground can see the station pass by overhead by tracking it using tools provided by NASA. 222: The number of people who have visited the ISS. 201: The number of spacewalks taken so far to assemble, maintain or repair the space station. 135: How many times you would have to cross North America to travel a distance equal to that traveled by the ISS in one day (about the distance to the moon and back). 90: The number of minutes it takes the ISS to circle the Earth as it travels at 4.8 miles (7.7 km) per second. 75 to 90: The number of kilowatts of power that is supplied by an acre of solar panels. 52: The number of computers aboard the ISS to control its systems. 52: The number of expeditions that have launched to the station. 18: The number of countries represented by astronaut crewmembers. 8: The total length, in miles, of wire that connects the electrical power system (12.9 km). 6: The number of months that an astronaut typically lives and works on the ISS during a mission. 5: The number of unmanned spacecraft used to haul supplies to the space station. Robotic spacecraft include Russia's Progress vehicle, the European Space Agency's Automated Transfer Vehicle and Japan's H-2 Transfer Vehicle. NASA also has contracts with the company SpaceX to provide cargo flights using its unmanned Dragon spacecraft, and with Orbital Sciences in Virginia to do the same on its Cygnus spacecraft. 4: The tons of food required to support a crew of three for about six months (3,630 kg). The ISS crews' favorites include shrimp cocktail, tortillas, barbecue beef brisket, breakfast sausage links, chicken fajitas, vegetable quiche, macaroni and cheese, candy-coated chocolates and cherry blueberry cobbler. Lemonade is the most popular drink. 3: The size of the station's first crew in 2000, and the number of astronauts or cosmonauts ferried to the station on a single Russian Soyuz spacecraft. 2: The size of the smallest crew ever aboard the ISS since long-duration missions began.